Need gifts for loved ones? Want to send Congress, Wall Street and Corporate America a message loud and clear? Want to do both at the same time? I'm sure everyone's heard about the "Occupy Wall Street" movement and others like it around the world. Well, I'm hoping to start an Occupy Wall Street movement of my own to aid in global economic recovery... yup, BIG dreams :) How, you ask? Well, we know Congress, Wall Street and Corporate America are NOT going to get us out of this mess. That's for sure. It's SMALL businesses like mine and those of other artisans and entrepreneurs that are going to do it. We're all doing more with less so make the most of your hard-earned dollars this holiday season...let them do TRIPLE duty!! No matter what gift-giving holiday you're celebrating, you can Occupy Wall Street AND help our economy by shopping with handcraft artisans online and locally. 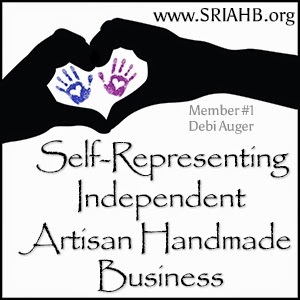 When you buy from individual designers, artists and other crafts people, you're supporting small businesses. You're supporting the business of the individual designer AND all the businesses...usually small businesses...that they do business with. And growing these small businesses is what will get our economy back on track and be instrumental in keeping it there! This applies in any country around the globe. AND at the same time, you'll get truly unique and precious gifts for your family and friends that will make your holidays more meaningful. It's a win-win-WIN :) And I'm going to help you! 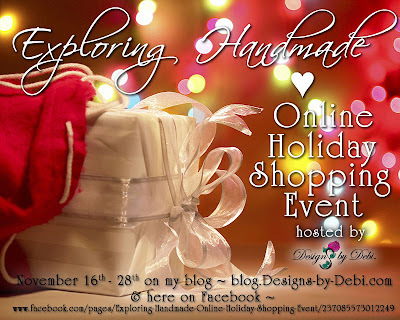 I'm going to be holding an Online Holiday Shopping Event... "Exploring Handmade" ...on my blog and facebook from November 16th thru November 28th... yup, right thru Black Friday, Small Business Saturday AND Cyber Monday!! Each day of the event I'm going to introduce you to different handcrafts and some shops where you can find them. Then on Cyber Monday we'll quickly recap all the different types of handmade gifts you can choose from and you'll be ready to do your shopping...if you haven't already finished by then because I'm going to be showing you lots of great shops, beautiful items (often one-of-a-kind) and introducing you to some wonderful artisans that you can add to your gift-giving superstar arsenal!! Excited? I am! If you want a little head start, head on over to my website and read my article "Why Buy Handmade Jewelry?" (http://www.designs-by-debi.com/why-buy-handmade-jewelry.html) which actually isn't only about jewelry. I think you'll find it interesting. And you can leave comments there too... tell us your thoughts and ideas about handmade gifts, ones you've given or received or about YOU if you're an artisan yourself! I'm looking forward to celebrating all the wonderful Artisan Entrepreneur Small Businesses with you this Holiday season!! I'll see you for that on the 16th. In the meantime, my friend Jan from Jan Tanis Designs is holding a Stroll the Shops for Christmas event on her blog from November 1st - November 12th and she's sharing some really great stuff, too. If you'd like to join the stroll, just visit her blog at http://jt-jantom.blogspot.com. Have fun! Amazon.com has a service called the Universal Wish List that allows you to add items from ANY website to your Wish List on Amazon.com. The add-on is free to download. You can find it here... http://www.amazon.com/wishlist/universal/ Once you have the little button on your tool bar, you can quickly add items from any site! If you're shopping with artisans on ArtFire.com, you'll see the "Add to Amazon Wish List" button right below the Add to Cart button on every item page. You can make your Amazon Wish List searchable, print it, email it to family and friends and even share it on Facebook and Twitter. So it's super easy to compile your gift ideas in one place to make YOUR shopping easier. And it's the best way to get exactly what you want, too...LOVE that!! Sounds like an awesome idea!! I can't wait!!! Sounds exciting! Thank you for sharing about the Amazon gift/wish list!